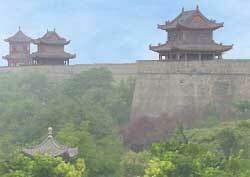 Many cities in China once had massive defensive walls to thwart invading armies. Among the few city walls that remain, the one of Xi'an is undoubtedly the most impressive and photogenic. The sloped, rectangular wall is 14 kilometers (8 miles long) and encloses the old center of Xi'an. However, only the southern half of the Xi'an city wall has been significantly restored and rebuilt. But that portion runs over 5 kilometers (3 miles) and is striking. The height of the Xi'an City Wall of today averages 12 meters (40 feet). Each side of the rectangular wall has a gate. Each corner of the wall has an imposing watchtower. Between those watchtowers are smaller lookouts in the form of projecting ramparts. They are spaced at 120 meter (400 foot) intervals. This assures that arrows can reach any point along the wall where the enemy may be attacking. The wall between the ramparts is crenelated (notched) for shooting and shielding. The Xi'an crenatures once numbered 5,894.